And so the Nigel Mansell express was derailed at Mid-Ohio. 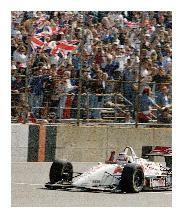 Like Alain Prost, Mansell started the weekend of September 12 poised to clinch a championship. 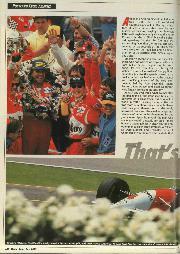 Unlike Prost, however, Mansell knew almost instantly on that Sunday that he'd have to wait at least another weekend (the Nazareth round took place as this issue of Motor Sport was being printed) before being crowned 1993 champion. With Mansells once cushy 34 point lead down to a slender, but still useful, 14, there's a good chance the championship will go all the way to the Laguna Seca finale (on October 3) and a real, though slim, possibility that Nigel won't win it at all. 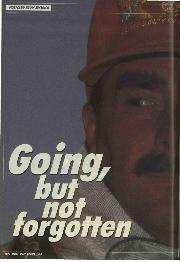 Regardless of the eventual outcome, however, even Mansell's harshest critics must admit that this has been a magnificent season for the 1992 world champion. Unlike last year. Nigel has not enjoyed a marked technological advantage over the competition. Indeed, by most accounts the Lola 193/00 is no match for the Penske PC22, and if the Ford/Cosworth XB is marginally better than the Chevrolet V8C, the overall Penske/Chevy package is the one to beat. Although Mario Andretti won the Phoenix race in a Lola-Ford and Danny Sullivan and Al Unser Jnr each won in a Lola-Chevy, it's taken all the considerable skill and courage of a World Champion to carry the fight to the Chevrolet-powered Penskes of Emerson Fittipaldi. Paul Tracy and, on occasion, Stefan Johansson. That Mansell gave away one race Phoenix and still had a 33 point lead going into Mid-Ohio (then added another with his pole there) is all the more remarkable given the fact that he had never raced on any of the circuits before, had never raced on an oval of any kind and had never even so much as tested on the Long Beach, Detroit, Toronto, Cleveland and Vancouver temporary circuits. Of course Nigel made a classic rookie's mistake over-driving on an oval and crashed at Phoenix. But he learned a painful lesson that day in the Arizona desert and he positively thrived at the Indianapolis Motor Speedway in May, despite missing half a week of practice owing to back surgery stemming from his Phoenix shunt. 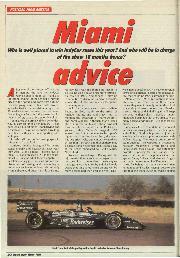 If he put those Phoenix lessons to use in the first 475 miles at Indy, he learned all about restarts at the hands of Fittipaldi and Arie Luyendyk in the final miles lessons he put to good use in winning the Milwaukee race a week later. So well did Nigel adapt to IndyCar racing, that he won on what is, Nigel Mansell has done a fine job this season, no question, but as the IndyCar season enters its final throes, our American correspondent wonders whether his opposition hasn't been a little thin? arguably, the single most fearsome race track in the series at the Michigan 500, and truly came of age by beating Tracy and Fittipaldi at their own game on the New Hampshire bullring. And yet . . a case can be made that Mansell's PPG championship, no matter how well deserved, will have been won against comparatively thin opposition. For openers, he didn't have to face Michael Andretti and Rick Mears. Sure, Michael hasn't exactly taken F1 by storm, but the fact remains that he was an awesome force in IndyCar racing from 1990 through 1992. And his drive at Monza at least gave some hint of what we have observed with regularity in the States. There will never be another Rick Mears, of course, and while it had been some time since he mounted a serious bid for the PPG title, don't think for a minute that Nigel would have won three of his four oval starts had Rick been calling the shots from the cockpit instead of the pits. Of those he has faced, Emerson Fittipaldi responded magnificently to the challenge of racing against a man whose first World Championship came fully 18 years after his second. 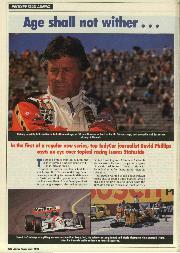 Only a maddening series of mechanical problems throughout the month of August blunted his championship bid. 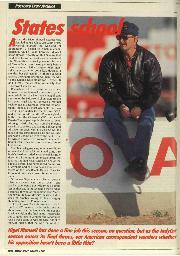 Paul Tracy came of age in 1993 and, from Portland on proved to be Mansell's stiffest opposition. 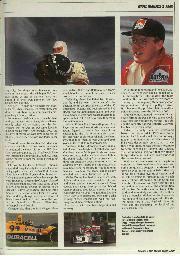 The first three months of the season were 24 year-old Canadian's undoing, though, and even a driver of Tracy's talent could not climb out of the hole he dug himself at Phoenix, Milwaukee, Indianapolis and Detroit. Consider also that the Rahal/Hogan, Ganassi, Walker, Galles and Bettenhausen teams which looked so capable on paper never lived up to expectations. Defending champion Rahal bit off more than he and his team could chew with the decision to run an updated version of the '92 Truesports chassis. The rechristened Rahal/ Hogan was an unmitigated failure, and even Rahal & friends were hard pressed to get up to speed in their '93 Lola/Chevy once they made the switch in lune. With a '93 Lola, Ford-Cosworth power, Arie Luyendyk and engineer Morris Nunn, Ganassi racing figured to win a few races if not challenge for the title. Unfortunately, Luyendyk and Nunn could never rekindle the chemistry that took them to two wins and sixth place in the 1991 PPG championship. Similarly, Walker Motorsports was unable to follow-up on a fairytale 1992 that saw Scott Goodyear win at Michigan, finish an oh-soclose second at Indianapolis and take fifth in the points table. Going from a one car to a three-car operation over the winter, with the addition of Willy T Ribbs and Hiro Matsushita, may have been necessary for the long-term financial health of the team, but it clearly affected their competitiveness in 1993. Galles Racing has had its successes, with Sullivan winning a controversial Detroit race and Unser scoring a superb victory in Vancouver. But having given up on the ill-fated Galmer chassis, they faced a steep learning curve with the '93 Lola. The fact that, like the other Chevrolet customers, they didn't take delivery of their chassis until well into February and then crashed in their first test set them back beyond a full recovery. With Stefan Johansson and Penske PC22Chevies, Bettenhausen Racing looked set to join the big boys. Unfortunately, the team found out the hard way that there's more to running up front regularly than buying good equipment and hiring a top flight driver. Horrible reliability problems left them with a paltry 15 points after the Michigan 500. And while most figured the HalINDS and newly formed Budweiser King teams would have their ups and downs, neither Teo Fabi nor the recently sacked Roberto Guerrero has been a serious factor.